Hey y'all! Today, I'm sharing a rare bonus blog post because I really wanted to share this awesome Target find with you today! 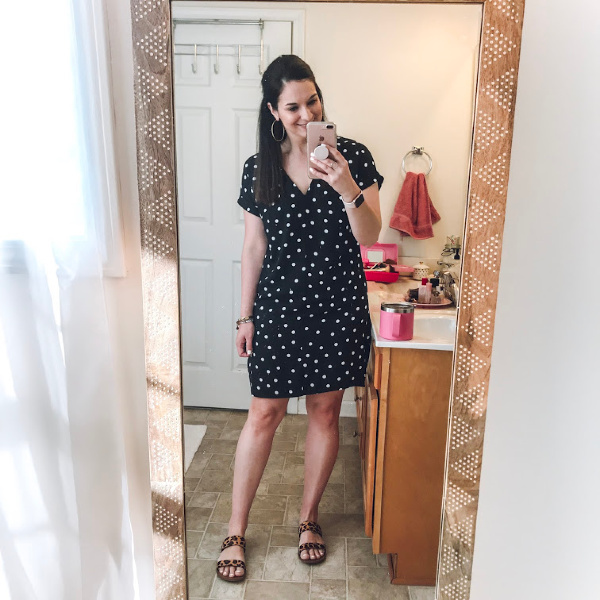 I saw this dress online last week and immediately ordered it because it's polka dotted and it was only $20! I saw it in the store the next day and I really happy that I purchased it because it was even better in person! 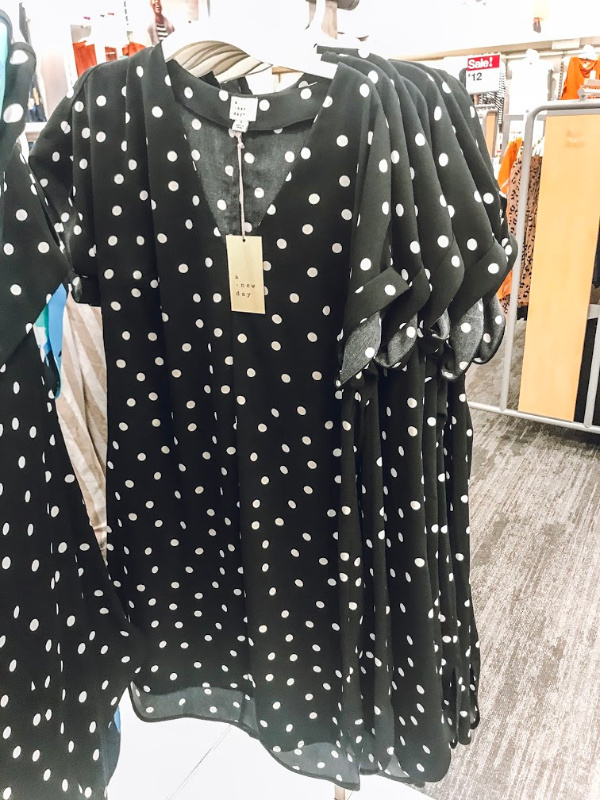 Polka dots are such a timeless print! This dress fits true to size and I went with my normal size small. For height reference, I'm 5'5" and I can easily wear this dress with flats or heels without it looking too short. I love how the back of the dress comes down a little longer than the front (you can see it in action on my Instagram stories today). 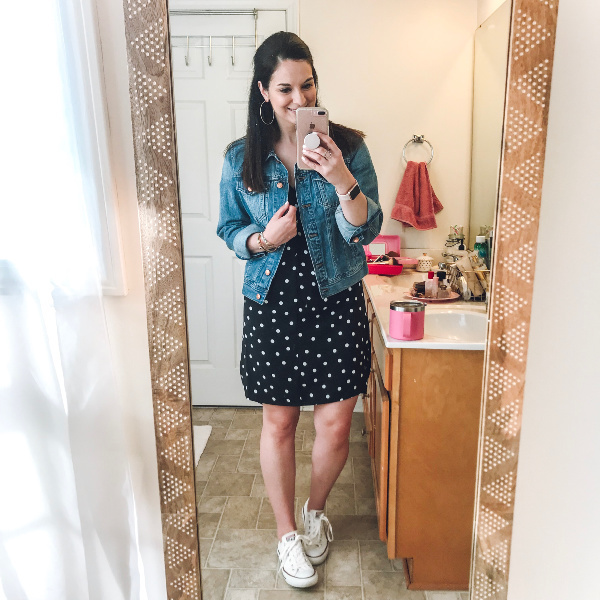 Below, I'm styling this budget friendly dress five different ways for spring! The first way I've styled it is probably the most obvious: with sandals. This is a throw on and go kind of outfit that you don't even need to think about. Instantly put together and pretty. The sandals also fit true to size and I love the rhinestone details. 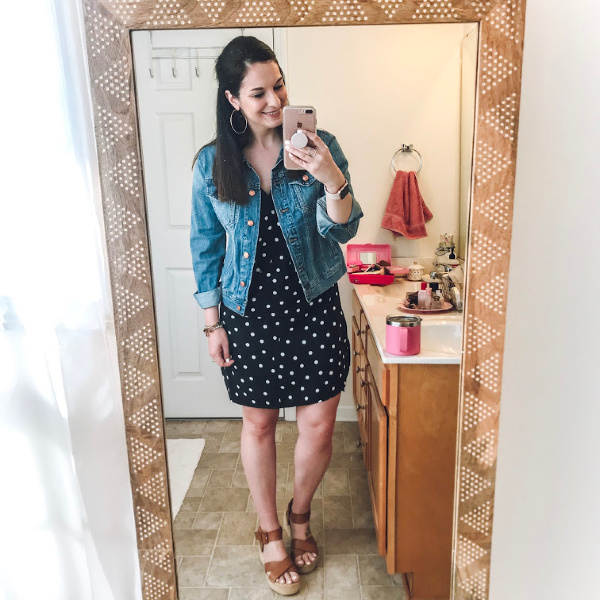 When I first saw this dress online, I knew I would style it with my denim jacket. A denim jacket is the perfect layer for springtime. To dress this look up a bit, I paired the jacket and dress with flatform espadrille sandals. I have owned this pair for several years and they are still one of my favorite pair of sandals. I sized up one size in the jacket and the espadrilles are true to size. I really love to wear sneakers with dresses and skirts to instantly make the look more casual. I kept the denim jacket for this look and added white sneakers. The perfect outfit when you want to look put together but comfortable. I would wear this for running all of my errands! I've owned this Converse sneakers for over years and they are a definite closet staple for me. This dress is date night ready by simply adding heels! You could wear this dress for a business casual setting and I definitely would have worn it when I was teaching in the classroom. My heels are true to size and actually very comfortable to walk in! 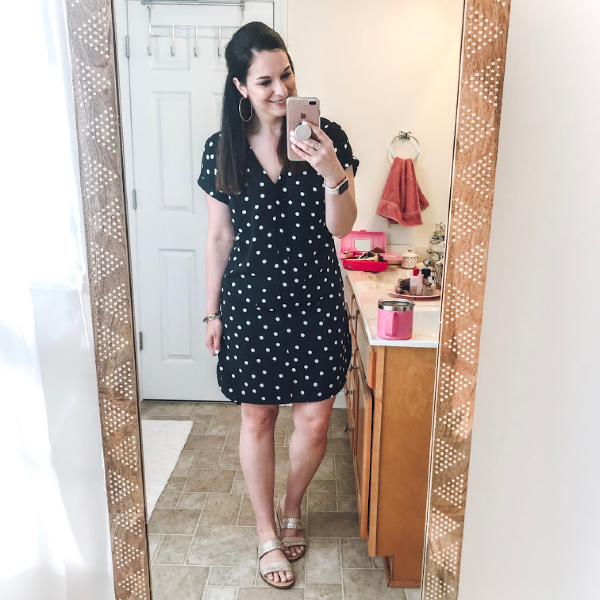 I love a good subtle pattern mix and the polka dots on this dress mix so well with leopard. 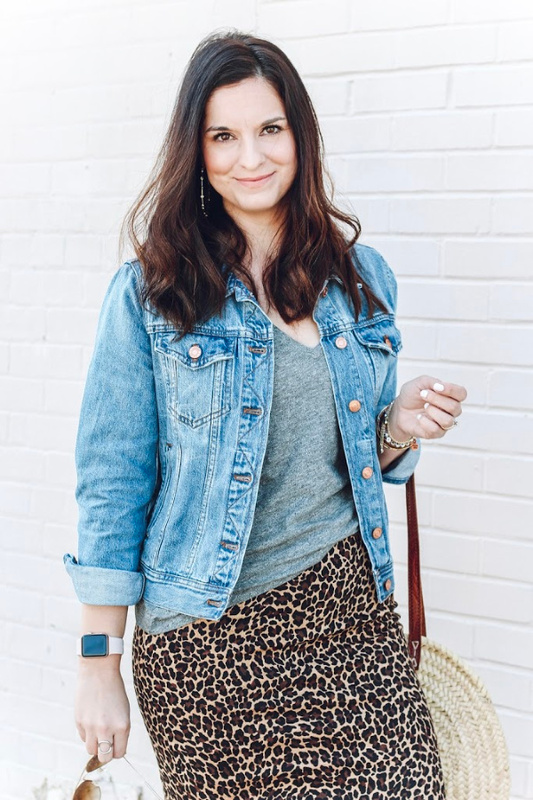 Two of my very favorite prints in one outfit! The biggest secret to successfully pattern mixing is to find coordinating colors. Since both of these pattern had black in them, they mixed easily together without looking over the top. 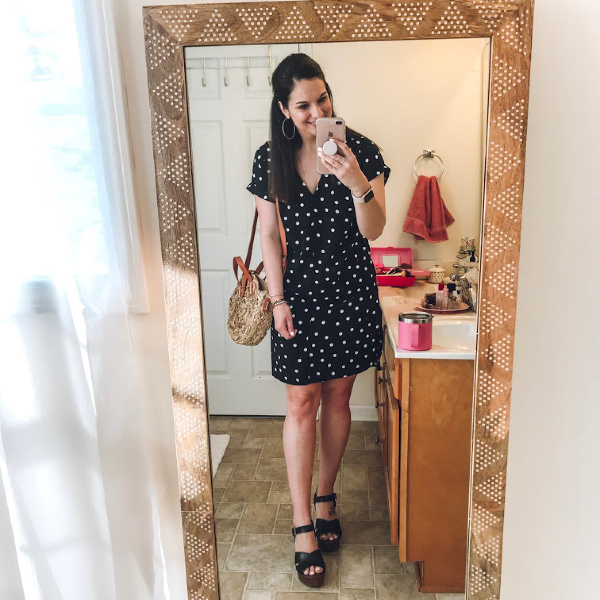 My sandals are so comfortable and add the perfect pop of print to any spring or summer outfit. I'm a true 8.5 and the size 9 worked best for me.